Members of the Ohio State Mansfield homecoming court include Nella Blackford, Jordan Landis, Jordan Morse, Joey Burley, Maris Bucci and Greg Palmerton. Morse and Burley were named queen and king at ceremonies in Columbus. 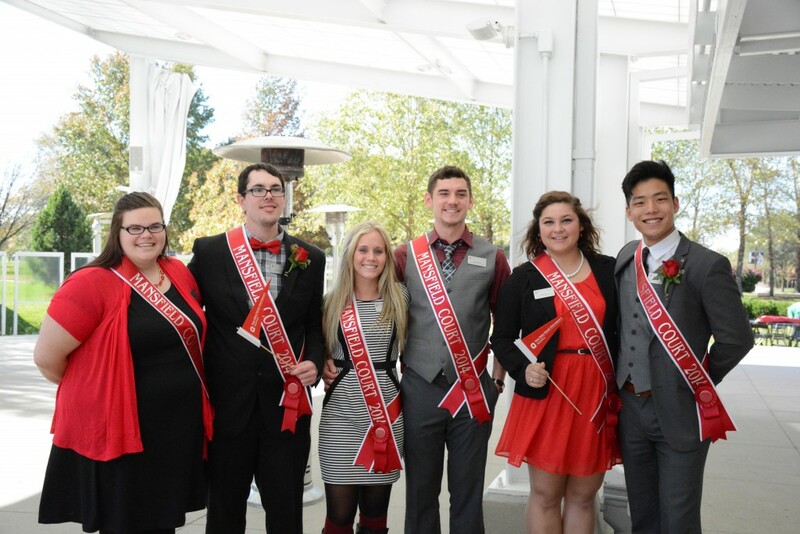 Ohio State Mansfield junior Jordan Morse and senior Joey Burley were crowned Mansfield Homecoming Court queen and king at a ceremony Oct. 17 on the Columbus campus. The court also included Nella Blackford, Maris Bucci, Jordan Landis, and Greg Palmerton. The court was chosen through an interview process with faculty and staff, who looked for campus and community involvement, volunteer work and GPA. Students then selected the king and queen from the court. Morse is from Ashland and is studying Psychology. She plays on the Mansfield Mavericks Volleyball team and is a third-year resident advisor & office assistant at university housing Molyet Village Apartments. She also works with children with disabilities at Raemelton Therapeutic Equestrian Center. Joey Burley also is from Ashland, pursuing degrees in Psychology and English. He is involved in Psychology Student Association, English Club and Boxing Club. He participates in theater productions and is a certified research assistant in the Psychology department. Burley is also an office assistant and resident advisor at Molyet Village Apartments as well as a summer cleaning and maintenance staff manager. Nella Blackford, a senior Early Childhood Education major from Ashland is involved as an ally in OutLoud, as well as Club Ed and the Book Bunch. Communications major Maris Bucci is a sophomore from Bellville. She is a Buckeye Ambassador, an intern in the Office of Student Engagement, Campus Activities Board co-leader, Camp Hetuck facilitator, a member of the Mavericks Volleyball team, and involved in the Haiti Empowerment Project and 2014 OSU LeaderShape Institute. Jordan Landis, a senior from Crestview, is studying Middle Childhood Education. Landis has worked as a tutor in the Conard Learning Center since 2012. He is also a member of Club Ed – a student organization for education majors. Greg Palmerton, a sophomore from Norwalk, is studying Biology and Pre-Med. He is a Buckeye Ambassador, an intern in the Office of Diversity and Inclusion, and is involved in undergraduate research. Homecoming events included a number of activities on the Columbus campus – the Ohio State homecoming parade, pep rally and recognition during the Buckeyes homecoming football game. The Mansfield Homecoming Court commits to a year of service projects. During Homecoming Week they took whipped cream pies to the face to raise money for the Domestic Violence Shelter. Posted by Christina Drain at 8:07pm March 5, 2015 Posted in Students/Campus Life. Bookmark the permalink.